Editor/Author Narayan, Ambar, Van der Weide, Roy and Cojocaru, Alexandru, et.al. 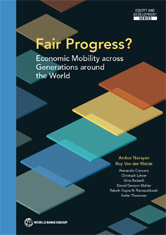 Why Does Intergenerational Mobility Matter? What Is Meant by Intergenerational Mobility? Why Is Mobility across Generations Important? Mobility across Multiple Generations: Do Grandparents Matter? What Do Today's Enrollments Suggest about Intergenerational Mobility of the Next Generation? Why Are Mobility-Enhancing Policies Not Adopted or Implemented Effectively Often Enough?